Caption on back: Weaver's Famous Lebanon Bologna, Lebanon, Pa., Since 1885. Special curing in old fashioned smokehouses gives our Lebanon Bologna its unique flavor. Comments: I have eaten MANY Lebanon Bologna sandwiches — on white bread with mayo — over the years. For long periods, that has been my favorite luncheon meat. 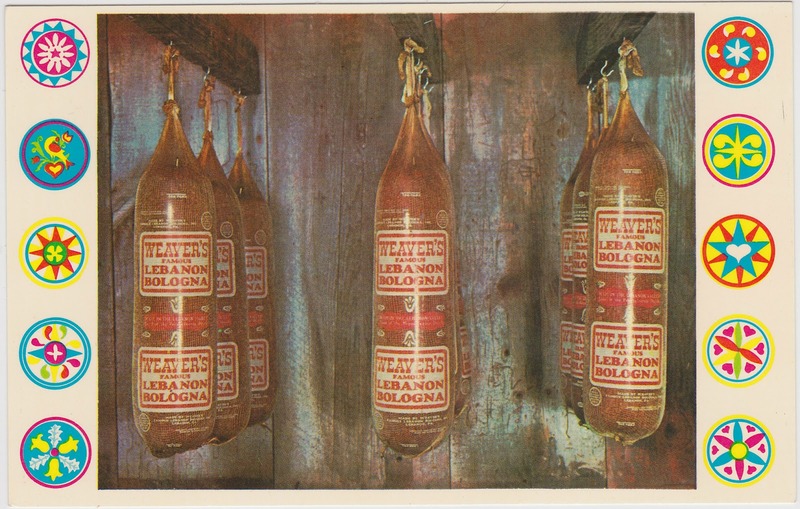 ... An excellent article about the storied history of Lebanon Bologna was written by Stephanie Shapiro and published by the Baltimore Sun in 2005. ... The biggest brand name in Lebanon Bologna these days is Seltzer's, which has been around for more than a century. ... Weaver's, meanwhile, was acquired by Godshall's in 2005 and is now part of that larger company, which also includes the former Kutztown Bologna Company. Papergreat's Chris Otto is spending June 5, 2013, blogging as many vintage postcards as possible. It's "The Fast and Furious" (and hopefully also "The Fun") for ephemera lovers and deltiologists. Read all of the posts starting here. Or if this post got you really hungry and you want to dig into some recipes, start here.